The first part of this tutorial series dealt with how to cut any un-flattering, badly fitting t-shirts to suit your own style and body shape. 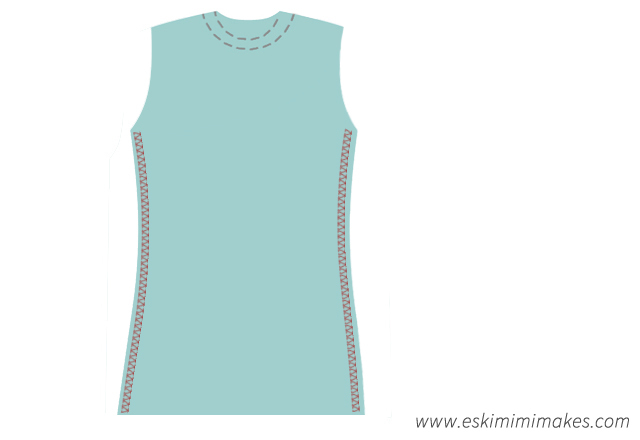 This part of the tutorial will deal with how to work with jersey knit fabric and stretch fabrics to ensure the best finish to your newly re-fashioned t-shirt. All of the tips here can be applied to all projects using jersey/knitted fabrics. Firstly, it is worth exploring all options as to which stitch to use. Unless you are lucky enough to have an overlocker or serger which is perfect for this job, it’s likely that you may have to make some adjustment to your usual choices if you are used to dealing with woven cottons, and fabrics with little stretch to them. 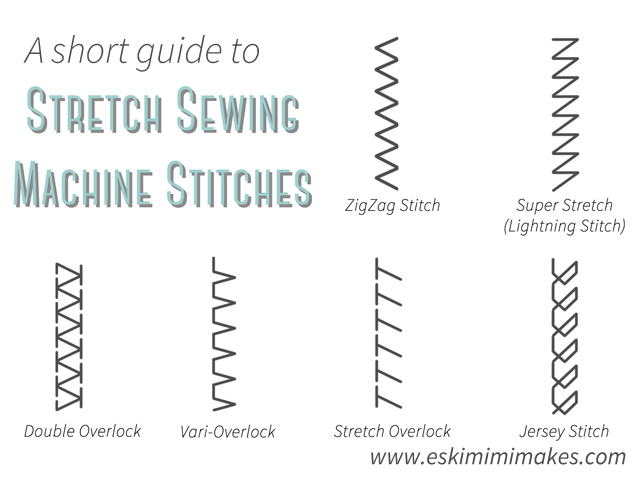 Many people use only the straight stitch on their sewing machine with perhaps the occasional zig-zag stitch for finishing seams. The good news is that as long as your machine can do a simple zig-zag stitch then you have a stitch option that is absolutely fine for sewing knits such as T-shirt weight jersey. Your machine may include some or all of the above stitches, and many more stretch stitches beyond. Choice of stitch can be purely personal choice, and making a small sample square of different stitch options might help form a decision. If limited to only a basic zig-zag, a small, narrow zig-zag to form the seam, accompanied by a wider zig-zag to neaten edges is a great starting point. My own personal preference is the Double Overlock stitch on my machine. It does not perform the job of a true overlocker, but gives both a nice seam stitch line and finishing zig-zag with outer seam line in one step. I use this to both sew the seams and finish them, trimming any excess fabric away from the finished seam once complete. Once the sewing machine set up with the correct needle (see Tutorial Part One for required tools and materials) and thread to match the main fabric colour of the t-shirt to be altered in both reel and bobbin (using woolly nylon in the bobbin if desired), re-assembly of the T-shirt can begin. 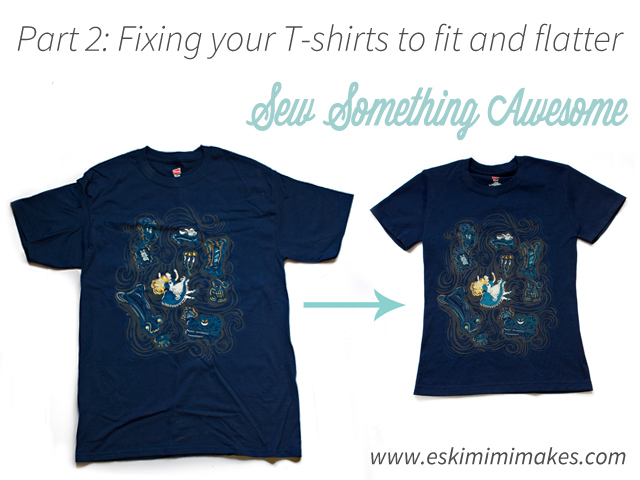 Start by ensuring that your t-shirt pieces are inside out. Your main T-shirt pieces (that make up the ‘body’ of your t-shirt) should be joined at the shoulder. Turn so that these are inside-out and align the side seams before pinning, ensuring that the underarm and lower hem points are aligned (it can be handy to pin at the underarm and bottom hem and then place pins at the halfway and then quarter-way points between these to ensure fabric is evenly distributed). Using your selected stretch stitch, sew both side seams using a 1.5cm (5/8″) seam allowance and removing pins as you reach them. 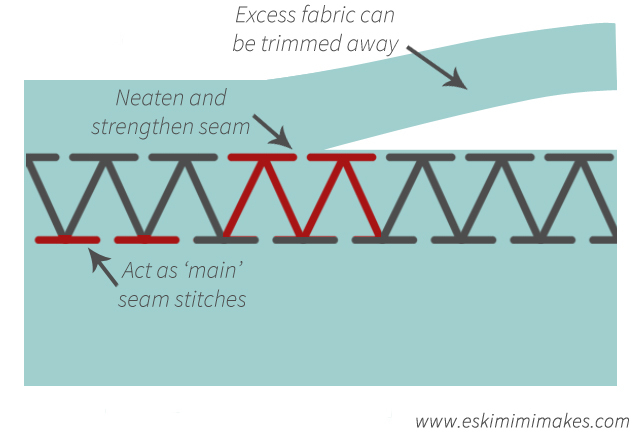 If using a narrow stitch (such as a narrow zig-zag stitch, or stitch that does not adequately ‘finish’ the edges) neaten the seam allowance with a wide zig-zag. Once both side seams are secured and sewn rim any excess fabric from the seam allowances at either side. Once the side seams are completed and neatened, place the body of the t-shirt to one side and start on the sleeves. Ensuring that the fabric for the sleeves is inside out, align the short bottom edge of each sleeve and pin in place before sewing with your selected stretch stitch and a 1.5cm (5/8″) seam allowance as with the body. Finish and trim the seams as for the body pieces. 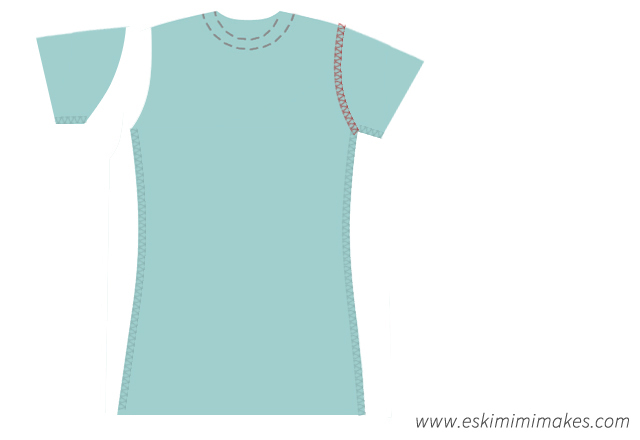 Pin sleeves to the body of the t-shirt, right sides together. 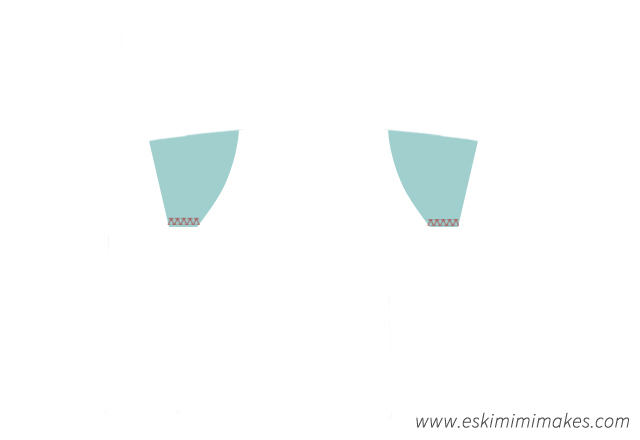 As you are sewing opposing curves it can be useful to first pin at the shoulder and underarm points (A & B in the diagram below) to ensure that the sleeves are set in straight and even. Once the shoulder and underarm points have been pinned in place, place pins on half way between these two points at the front and back of the sleeve, trying not to over-stretch fabric. Place further pins between these, easing fabric as needed to distribute material evenly around sleeve with no gathers or puckers until sleeve is pinned in place all the way around. For ease of pinning sleeve can be tucked inside armhole to allow easy sewing. 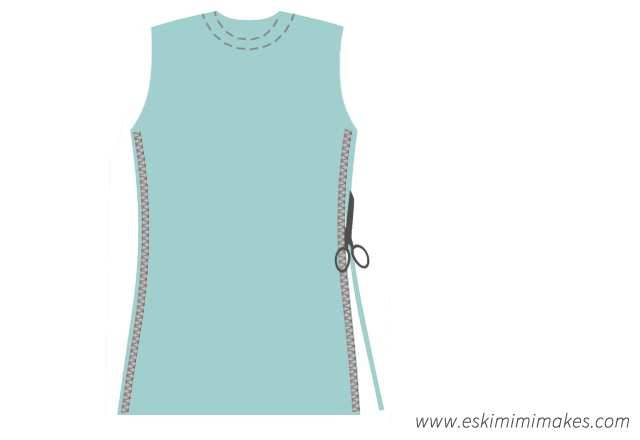 Sew sleeve to body using selected stitch and a 1.5cm (5/8″) seam allowance. Finish and trim seam as before. Repeat pinning and stitching instructions for the second sleeve. The t-shirt can now be turned the right way out and tried on to determine length. You can use a favourite t-shirt as a guide for length or just play around with tucking the hem up in the mirror until you find a length that you like the look of and that flatters. 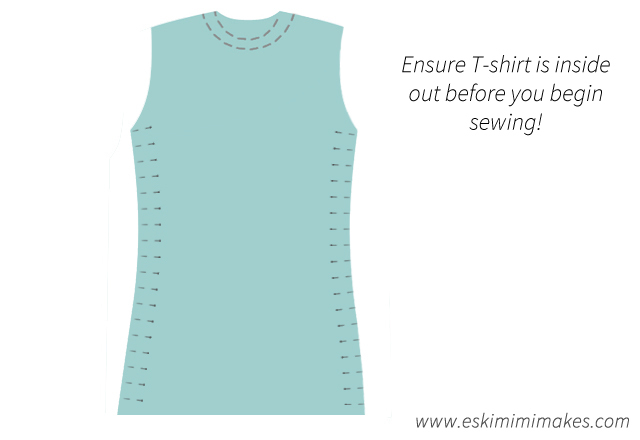 Mark the desired finished length of your t-shirt using either dressmaker’s chalk or an air-erasable pen. 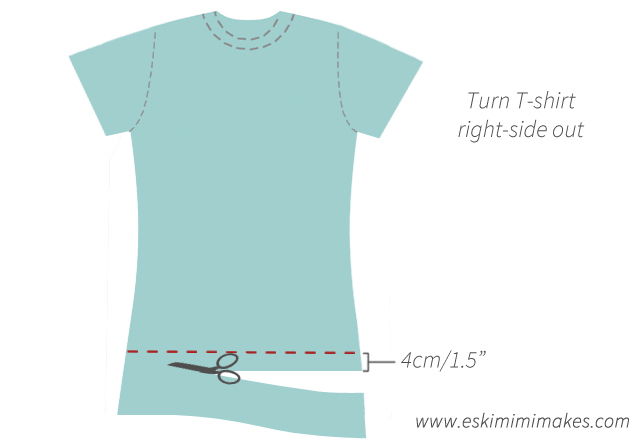 Mark a second line 4cm/1.5″ below this desired length and cut straight across t-shirt, ensuring an even hem depth. Turn the t-shirt hem up 4cm/1.5″ to your desired length, towards the inside of the t-shirt Only fold the hem once. It may be helpful to lightly press a crisp hem on particularly fine jersey fabric if the fabric is proving slippery or difficult. Pin hem to desired length and change your needle for your selected double ball-point needle. Again, woolly nylon thread can be used for the bobbin thread for added elasticity and ease of sewing if so desired. A double needle with a 4mm space between needles is recommended for maximum stretch and authenticity. With the right side of the fabric facing upwards, sew a line of double stitches 1cm (3/8″) from the folded hem. 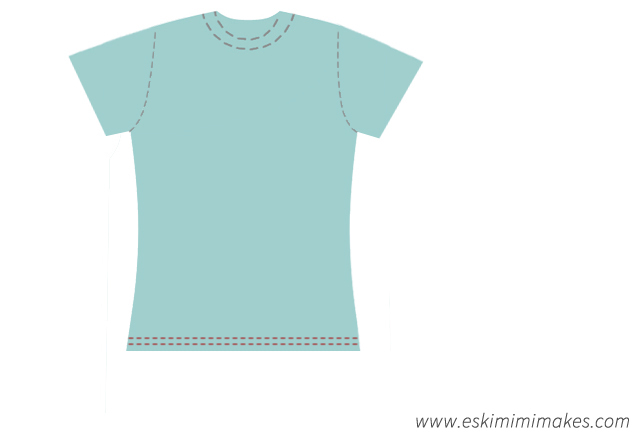 Once you are happy with the bottom hem, turn T-shirt inside out and trim any excess fabric to finish. Place tee onto body and admire your genius. For more tutorials, visit the Tutorials section of the site, where guides and how-tos are organised by craft and type. Don’t forget to visit the patterns and free projects and downloads sections of the site, too.